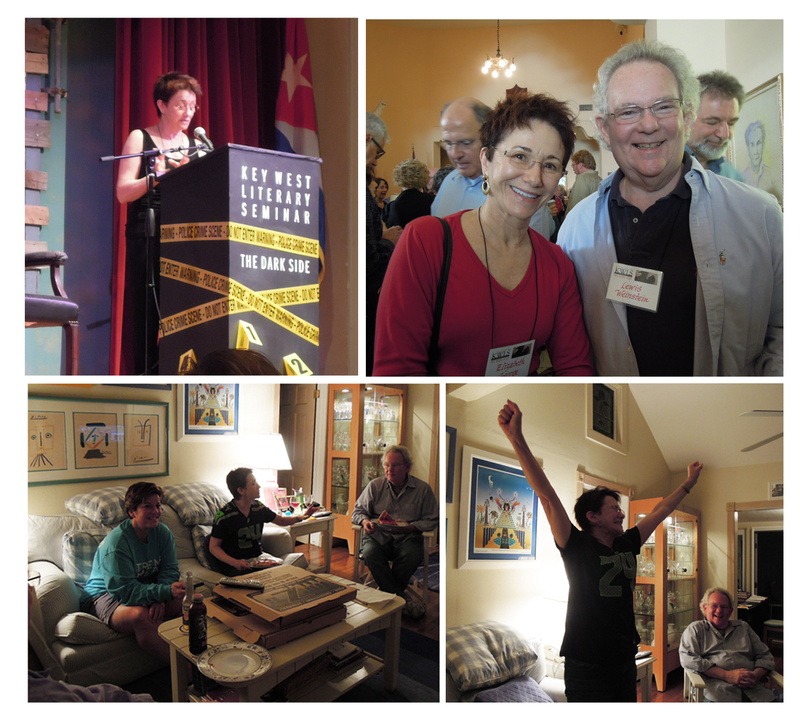 The 32nd annual Key West Literary Seminar, called THE DARK SIDE, focused on mystery and crime. The roster of authors included (1st weekend): Gillian Flynn, Sara Parestky, Joseph Kanon, Carl Hiaasen, Laura Lippman, Scott Turow and (2nd weekend): Elizabeth George, Lisa Unger, Lee Child, Malla Nunn, John Banville/Benjamin Black, Thomas Cook, Percival Everett, Kent Krueger, Michael Connelly, Michael Koryta, Tess Gerritsen and James Hall. There were individual presentations and panel discussions, and the chance to meet the authors. Pat and I attended the 2nd week. Elizabeth George gave a brilliant keynote address titled “Writing in the Dark, from the Dark, about the Dark.” Later in the week, we had the opportunity to listen to Elizabeth, take her to lunch, and then have her at our home for pizza and to watch the Seattle Seahawks win their way into the Super Bowl. And, by the way, I think her latest – Just One Evil Act – is the best in a great series. I had her autograph her book – Write Away – which is the best book on writing I have ever read. One of the great things about the KWLS is that the authors are easily accessible and very personable. 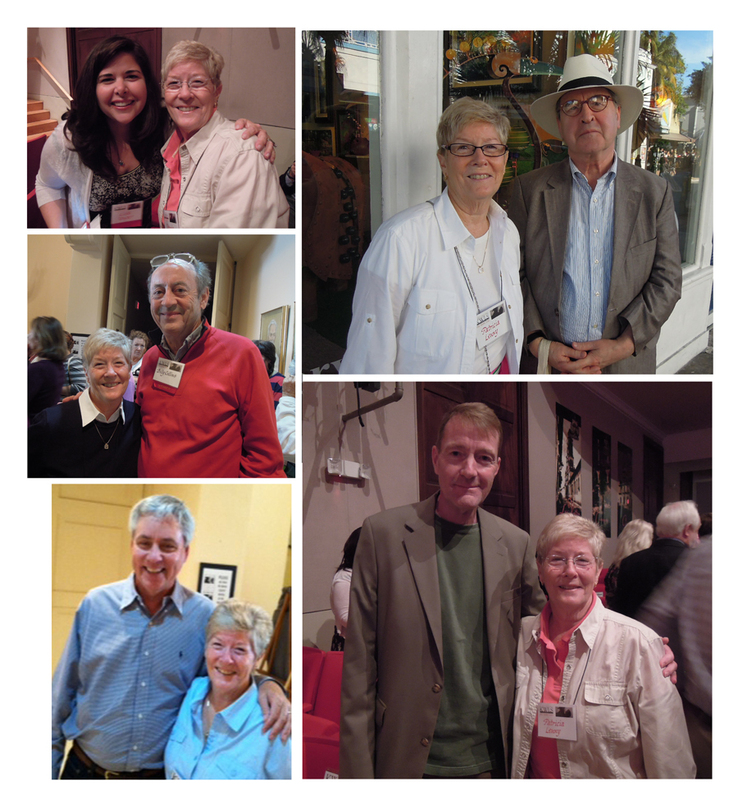 Here is Pat with several of the many authors we chatted up. On Friday afternoon, we were walking along Duval Street when Michael Connelly – yes, that Michael Connelly (Harry Bosch, Lincoln Lawyer) – came walking towards us. 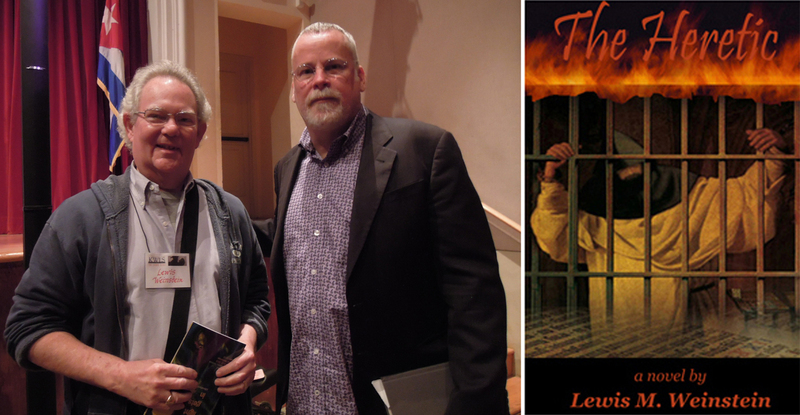 He came over to me and said, “Lew, I have something to show you.” Taking out his cell phone, he thumbed through his photos and showed me a photo of my book The Heretic. “I found this in my room,” he said. Pat and I had spoken briefly with Michael at a cocktail party the previous night, but I am just dumfounded that he made the connection and then was kind enough to show me what he had found. He is not only a great author, but a very nice man. 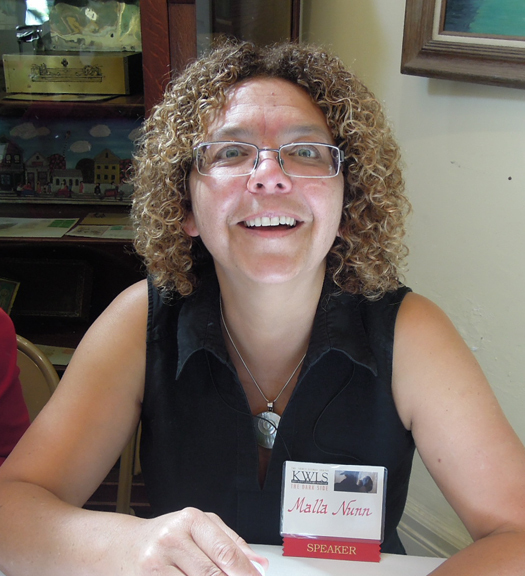 With all the well-known names, one of the pleasures of the KWLS is to meet new authors, like Malla Nunn, who writes crime stories set in South Africa. I have started to read Malla’s Let The Dead Lie and it is terrific. So is she. Pat and I spoke with her several times, including lunch together at the seminar’s concluding Conch Chowder Lunch. Added to the excitement of meeting so many great authors were the significant insights I received – from every session – into aspects of my own writing: how the slow building of dread can work even if you know the ending … people want to know the secrets behind the events … seeking out time-specific sensibilities … the private thoughts of historical characters, expressed in historical fiction permits a more illuminating portrayal than the history itself … characters lie (especially if they are the Nazis in the novel I am currently writing) … use, and choose when to reveal, the character’s misconceptions and purposeful lies. Thinking about writing is, for me, the main benefit of the sessions. This entry was posted on January 24, 2014 at 9:44 am	and is filed under * THE HERETIC, *** about writing. Tagged: Billy Collins, Elizabeth George, John Banville, Key West Literary Seminar, Lee Child, Lisa Unger, Malla Nunn, Michael Connelly, Tess Gerritsen. You can follow any responses to this entry through the RSS 2.0 feed. You can skip to the end and leave a response. Pinging is currently not allowed. Thank you for your thoughts and insights into what you gained from the seminar, Lewis. I’m a big fan of Tess Gerritsen AND of your own novel, The Heretic!